On the same morning I’m hearing Tory William Hague expressing moral outrage at the way Bashir Assad’s government is mistreating its own people I read the following story which demonstrates how HIS government is prepared to mistreat theirs. The hypocrisy was deafening. Lorraine Fraser,pictured above along with a photograph of her specially adapted bathroom, is a severely disabled mother of two children about to be evicted from her council home in North Lanarkshire because she’s been unable to pay the bedroom tax and is now in arrears that amount to less than Mr Hague is likely to spend on food in a week. Here’s the full story from the Daily Record. THE 46-year-old who suffers from scoliosis and arthritis has had court action taken against her to force her to leave her flat. A SEVERELY disabled single mum is to become the first council tenant in Scotland to be evicted because of the bedroom tax. 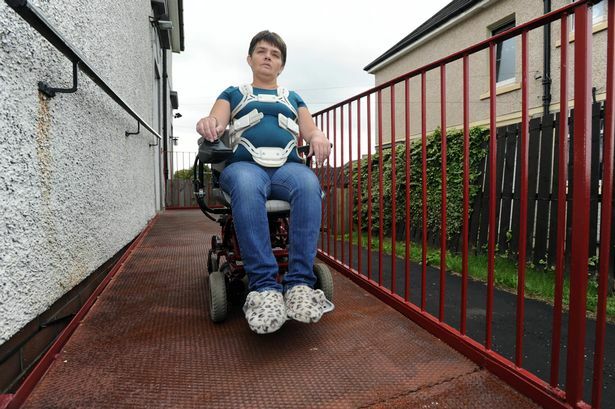 Lorraine Fraser is being kicked on to the street after her Labour-run council took court action to force her out her specially adapted flat. She has scoliosis – curvature of the spine – and arthritis and she is wheelchair-bound. 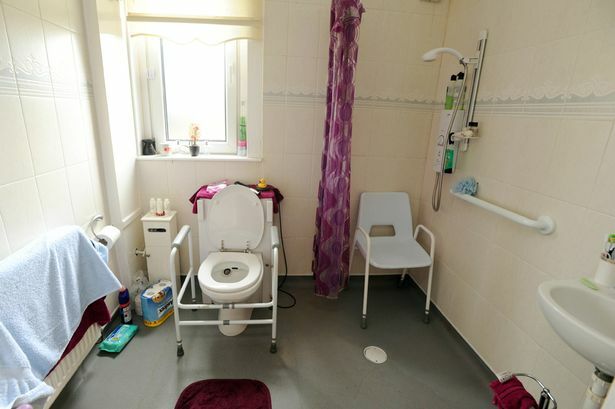 The council moved Lorraine into a specially adapted flat with a wheelchair ramp, wet room and handrails two years ago. Now they want to turf her out for failing to pay just £248 in bedroom tax arrears. Lorraine, 46, said: “Where will I go? I need a specially adapted home just to survive. “What kind of people would throw a disabled woman and her kids out on the street? North Lanarkshire Council have sent Lorraine a series of hard-hitting letters, warning her that eviction proceedings are under way. She has also been told she faces paying for the authority’s “considerable” legal costs. Lorraine receives disability living allowance. 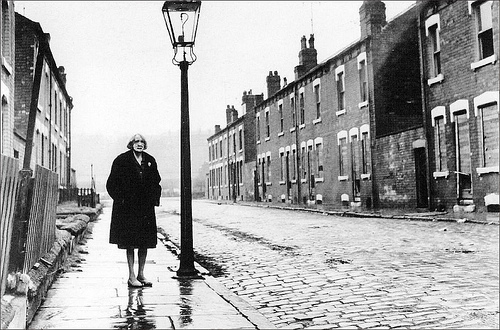 And even before the bedroom tax, she struggled to pay her bills and feed her family. When the hated tax was introduced in April, she was told she would have to pay an extra £62 in rent every month. She was informed she was being targeted because she has two spare rooms. But Lorraine is baffled because she shares her three-bedroom flat with her daughter Collette, 19, and son Mark, 17. They are both students who live at home, although they also spend time living with their dad, who is divorced from Lorraine. Lorraine thought she still had a month left to fight her case because she was told in a letter that legal proceedings to evict her wouldn’t begin until September 2. But she was devastated when the council’s letter on August 8 said they had already started court action. Council housing officers visited her at her home in Uddingston, near Glasgow, yesterday to go through the eviction process. Lorraine said: “I can’t believe I am going to be thrown on the street. “My condition is getting worse every day. This has caused me so much stress and anxiety it’s making me really ill.
“I feel at the end of my tether. I have tried to explain to them that my children still live here. “My son sometimes stays at his dad’s house because we are divorced but this is still his home. “I feel angry, upset and totally helpless. “I thought I still had a month to sort this mess out but then I got a letter to say they had already started the legal process. “I feel like my life is falling apart. I have been in this house for two years and it was the council who put me here because they knew I needed a specially adapted home for my disability. “Now they want to throw me out on the street like a piece of old rubbish. “They are targeting the most vulnerable in our community. North Lanarkshire Council are one of the few local authorities in Scotland who have refused to adopt a no-evictions policy. In April, First Minister Alex Salmond pledged that no SNP-run council would throw out tenants who had fallen into arrears because of the bedroom tax. North Lanarkshire Council leader Jim McCabe called the bedroom tax “the single worst piece of legislation I have ever seen”. But that hasn’t stopped the authority from starting eviction action against their tenants. Lorraine called on the All Scotland Anti-Bedroom Tax Federation and Glasgow lawyer Gordon Dangerfield to help save her from eviction. Federation chairman Tommy Sheridan said: “North Lanarkshire Council’s treatment of a disabled bedroom tax victim is shocking and shameful. “How do these councillors and highly paid council officials sleep at night? They should be ashamed of themselves. “They told this disabled bedroom tax victim she had until September 2 to find the money or else. A North Lanarkshire Council spokesman said: “We have offered every tenant potentially affected by the bedroom tax an opportunity to have a visit or advice by phone. “The tenant in question has consistently refused to fully engage with us and has repeatedly refused to apply for a discretionary housing payment which may help to alleviate her situation. Lorraine reacted with anger to the council’s claims that she refused to cooperate with them. This entry was posted in austerity, bedroom tax, disability, government, HOMELESSNESS, poverty, Tories and tagged Alex Salmond, bashir assad, bedroom tax, Cameron, curvature of the spine, Disability Living Allowance, eviction, Glasgow, Jim McCabe, Lorraine Fraser, North Lanarkshire, North Lanarkshire Council, Politics, Scotland, Tommy Sheridan, William Hague on August 22, 2013 by sparaszczukster.